Hello from Seattle! I’ve written most of this from the lovely Amtrak Cascade, en route from Portland to here. It’s a luxurious ride—trains are always better than airplanes, in my opinion—and the scenery is so lush. There’s every shade of green, yellow, and orange, and the train tracks are wedged between some substantial, tree-covered hills. And then air in Oregon! On my way to the train station it was so verdant and fresh I tried hard to figure out a way to take some of it with me. But onto food: This unexpected salad is one I brought with me on the airplane last week. I know it’s not much of a looker. The colors clash and bleed together, and no matter how I try to slice up the veggies, nothing seems more visually appealing than this pico-de-gallo-esqe pile of cubes. But that’s not to say you shouldn’t give it a shot. I was making one of those refrigerator dustbin salads—I wanted to use everything up before I left down for a little while—so I just swept it onto a cutting board, chopped it up, and threw it in a mixing bowl. As I was tasting it, I thought it seemed familiar; I was experiencing some déjà vu. Then I realized: There’s a salad much like it in Veggie Burgers Every Which Way. I find that having beets on hand can be a liability if you don’t roast them immediately and all at once. Otherwise the hour or two it takes to roast them ends up being prohibitive—too much advance planning. But if they’re already cooked, sitting in the fridge in a Tupperware, then it’s easy enough to add them to salad or sandwiches, or serve with a plop of yogurt, or just with salt, pepper, and a drizzle of olive oil. 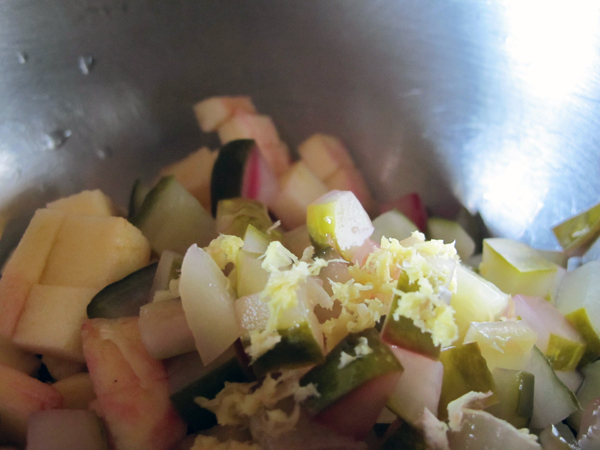 In this salad they share equal billing with apples and pickles. 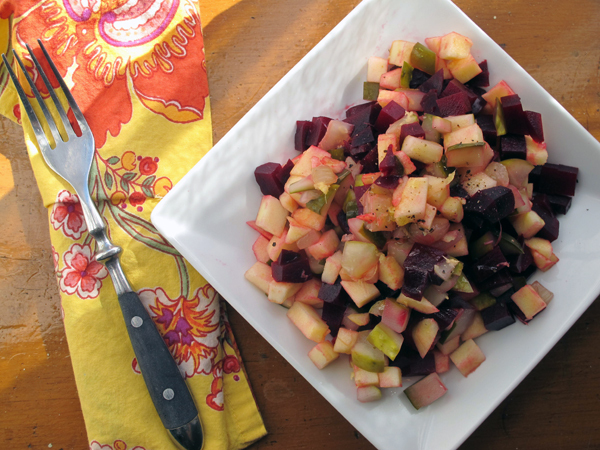 Sounds strange, I know, but somehow it works: the textures—tender beets, crisp apples, and springy little pickles—make for a surprisingly robust combination, and the two types of sweet, with the beets and apples, are perfectly bridged by the briny pickles. But what makes it in this variation from the one in the book is the ginger. I added just a touch, just a few gratings of the Microplane, and found that it brings something like effervescence. This is a juicy, refreshing salad for the fall. 1. Cook the beets: You can cook them any way you please, but I typically roast mine: Preheat the oven to 400° F. Clean the beet and trim off the ends. Place on a square of foil and rub with a bit of olive oil. Seal it up in the foil pouch, then place in the oven and roast until tender. This can take anywhere from an hour to 2 hours. 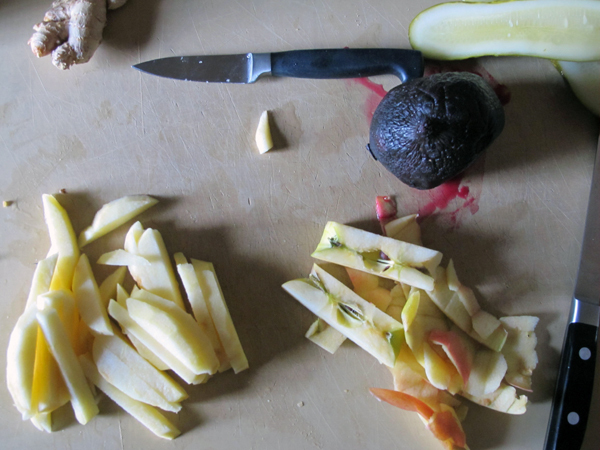 Start checking after an hour: a skewer or narrow knife inserted into the beet should meet no resistance. Allow to cool. 2. When cool, dice the beet into 1/2-inch cubes. Peel the apple if you please (I do; apple peel on my teeth is like fingernails on a chalkboard), and slice it and the pickle into the same sized cubes. 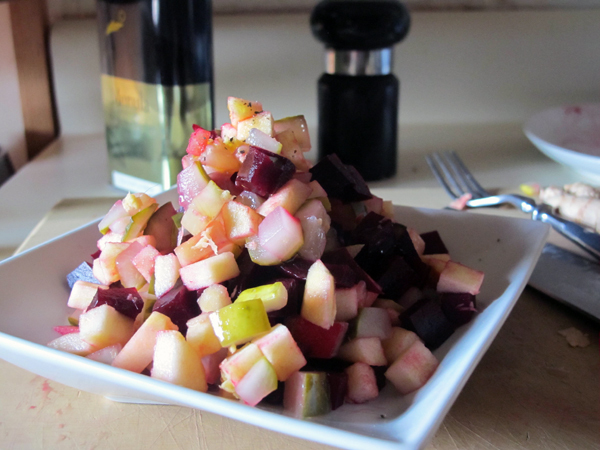 Combine with the ginger—not tossing too aggressively if you’re worried about the beets coloring the whole salad pink—then drizzle with olive oil, and sprinkle with salt and pepper to taste. This salad looks great. Just discovered your blog after reading my way through Veggie Burgers Every Which Way. I’m a two week old vegetarian and books like yours are so encouraging. Vegetarianism does not equal steamed vegetables and brown rice every night! Thanks, Cassandra! Good luck with the transition! There’s SO much more to it than steamed veggies and brown rice.